Here's a great film for Independence Day, one that celebrates the American spirit and the American Century — not to mention the most famous son of my own hometown, Winchester, Virginia. 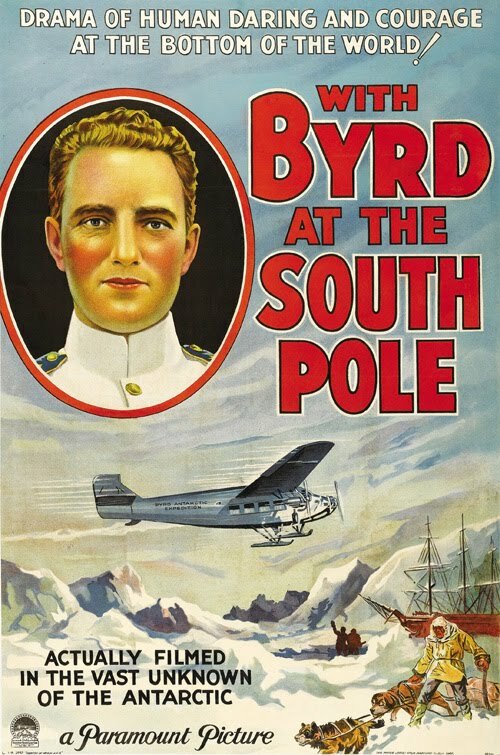 With Byrd at the South Pole is one of the earliest and most captivating film documentaries. 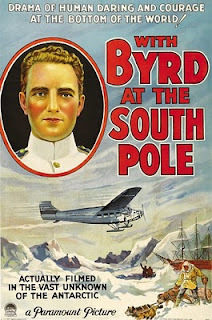 A deserving Academy Award winner for Best Cinematography, the film chronicles in stark realitytheAntarctic expedition that led to Byrd's famous flight over the south pole. 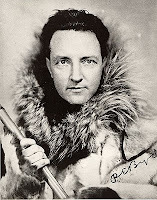 Richard Byrd seems to be one of the forgotten men of the first half of the twentieth century, possibly overshadowed by his contemporary, and sometimes rival, Charles Lindbergh. Byrd was one of the men who wanted badly to win the $25,000 Orteig Prize for being the first to complete the New York - Paris flight, but Lindbergh captured the award just ahead of him. Byrd would make the crossing a mere four weeks later, but was obliged to ditch his craft in Normandy when Paris was unapproachable due to fog. Yet Byrd was no stranger to the limelightin the twenties and thirties, and enjoyed the life of a national hero. He retired from naval life with the rank of rear admiral, and during the course of his lifetime was awarded with countless citations, including the Navy Cross, the Distinguished Service Cross, and the Congressional Medal of Honor. The film opens with a somewhat awkward sound introduction featuring the explorer / adventurer himself addressing the viewer. Clad in his white naval dress uniform, Byrd primarily offers thanks a brief explanation of his motivations,all the while looking sheepishly away from the camera — as if reading cue cards. The film then changes gears for the bulk of its duration, into a silent affair with classic titles cards. Although With Byrd at the South Pole was made at exactly the time studios were heavily engaged with the transition into talking pictures, lugging sound equipment into the wasteland of the film's location would have been impossible even a decade later. We are shown the expedition from beginning to end, from the opening shots of the heavily laden ships leaving New York Harbor to their journey south, eventually to break through the ice pack and make harbor on the barren plateau of Antarctica. 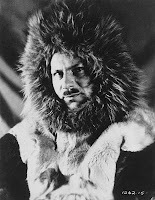 We see the dozens of adventurers carve a base camp — known as Little America — out of the frozen landscape; build shelters for the three carefully assembled aircraft, the largest of which is fated to make the flight over the pole; store the seemingly unending supply of rations and equipment, and build friendships with the many Huskies brought to pull sleds and equipment across the expanses ice. In fact, one of the movie's more poignant moments comes when one of the older sled dogs becomes unableto shoulder his load or protect himself from the sub-zero temperatures any longer. We are also greeted by the wildlife of the region, as penguins and seals curiously explore Little America, and pods of whales startle the surface of the ice in search of breathing room. Weare treated to blizzards, gales, and unceasing monotony — including a single night that lasts more than four months. The greatness of the film is in its camera work. That the work of the two Paramount Studios "ace" cameramen would win the Oscar for their work must have been a foregone conclusion. Although the finished picture runs a mere eighty minutes, over thirty miles of footage was generated over the course of the two-year expedition — and the professional Hollywood filmmakers involved certainly knew their stuff. The juxtaposition of static shots, aerials, even handhelds, combinedwith the inherent drama of the situation, makes for a rewarding film experience as exciting and contemporary as any studio production. 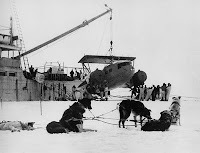 Sound returns for the film's final, climactic sequence, as Byrd and his fellows make their flight over the pole. A professional narrator speaks over spectacular aerial shots as the men back at Little America — and the world at large — wait for Byrd to complete his task. Although the events of the film occurred more than eighty years ago, I was nonetheless on the edge of my seat as the film came to aclose. This is a must for anyone interested in documentary films, as well as the Academy Awards. Having grown up in the same town as Byrd, his story is remarkably absent from the public memory — undoubtedly pushed aside by our town's somehow even more iconic daughter, Patsy Cline. In a way it's too bad,the example of Byrd's adventurous, quintessentially American spirit is missed.